PES offers multiple space options in a contemporary gallery setting that can host outside happenings of all kinds. Our 4,000 sq. ft storefront space is perfect for art exhibitions, performances, weddings, networking events, conferences, meetings, photoshoots, and more. 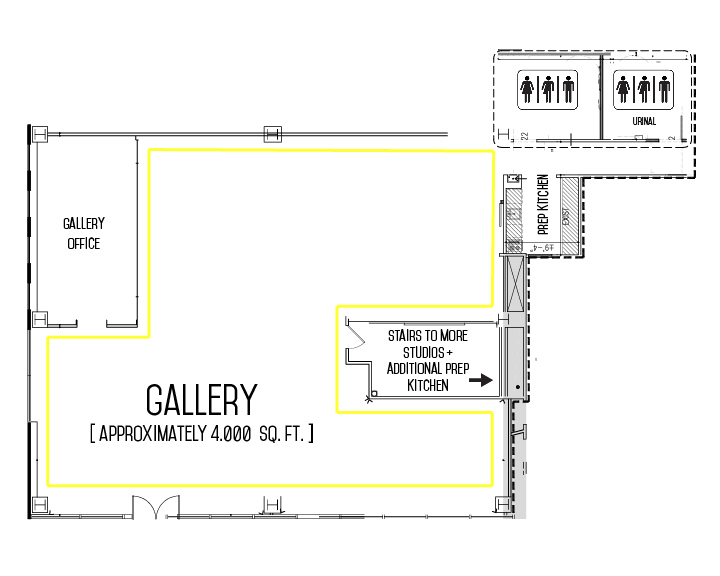 Additional spaces range from 400 - 1,500 sq. ft. for smaller events. Alongside of premium space, we offer a bevy of amenities and partnerships to help outfit your event. Am I eligible to rent PES Studios for my event? PES accommodates corporate, small business and nonprofit events (cocktail parties, seated dinners, networking events, presentations, holiday events and more) and certain types of social gatherings (weddings, seated dinners) because of the nature of our exhibitions. What is the cost to rent PES for my event? The base rental fee includes an 8 hour day rate, staffing, and general amenities. An additional fee can be negotiated for advanced amenities. What are your General Amenities? No, pricing is for space is only for use of space, staffing, and our general amenities. However, for an additional fee we offer advanced amenities. Can I have my Wedding ceremony and reception at the PES? Yes! We love when love is a focus in the gallery! We have had several types of ceremonies, both religious and non-denominational, in the gallery space. There are a number of parking garages within walking distance of PES. The closest parking garage is One Gateway Center Garage, enter at 43 Raymond Plaza West and is a 2 minute walk to GPS. Some metered street parking is also available. We can also refer a valet parking service. Send us an email at info@projectforemptyspace.org or call 973-818-2452 during our business hours.